Any proper restaurant owner must be able to view their restaurant menu beyond its obvious function. It is not just a compilation of items; it's the 'sales-person' of your establishment! Effectively pass a marketing message to customers. Show customers what the restaurant is able to provide. Express the personality of a restaurant and help meet the sales goals of a restaurant. Because of this, restaurant owners need to pay attention to their menu design and printing if they hope to be successful. What market gap can your restaurant fill? What do other restaurants offer? How much do other restaurants charge? What can you do to make your menu better than other restaurants? Remember that a bad menu may end up being a liability. Ensure that you offer translations for phrases or words that are not written in English. The actual entrees that you serve should match the photos. Always analyze your menu every few months. If some items are not profitable, remove or replace them. Compare your menu with competitors to get new ideas. 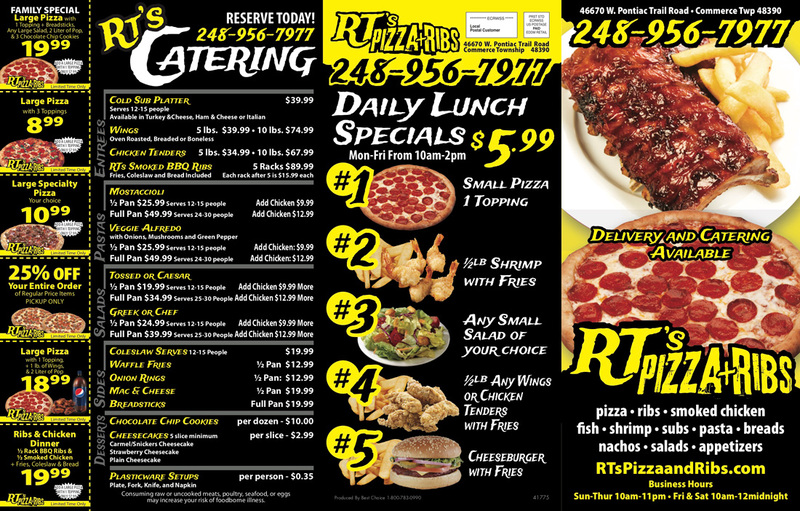 Pizza menu printing and take-out menu printing are no different. They also require the same level of planning and preparedness. Your menu should be presented in a logical way that makes it easy to find whatever food a customer is looking for. You should, for example, not list desserts before appetizers or dinner food before breakfast. Use colors that reflect the personality of our restaurant. Keep the print attractive and easy to read. You do not need to include every little detail in your menu. Keep it short and simple to avoid boring your customers. If you have special dishes, make them visible so that they can be spotted easily. Include numbers to make it easy for clients when ordering food with complex or unfamiliar names. To learn more about our qualifications and experience, contact us today for a personalized consultation. Start Getting the Word Out! If your promotional materials aren't cutting it, you haven't made the Best Choice! We're not just experienced printers, our designs will get you business. The contents of this webpage are Copyright © 2019 Best Choice Marketing Solutions. All Rights Reserved.